While my exposure to Pinot Noir from New Zealand (NZ) hasn’t been that extensive, all those I’ve tried have been quite good. The best part is the price point, as all the wines have come in under $20, which for good Pinot Noir, is really good. While I have had a few from Oregon and California in that price range, they aren’t as consistently bright, tending more towards dark fruits and a fuller body than one would like to find in Pinot Noir. This particular wine can be found retailing for between $15 and $20 depending on where you buy it and you may also find a variety of vintages, as this doesn’t seem to be the biggest moving wine. From what I’ve read, it has been quite good for a few years, both from “pro” reviews and “amateurs” I’ve seen on various forums / blog entries. As a matter of fact, the 2008 vintage of this wine received a 91 from Wine Spectator and the 2007 got a solid 89. This particular wine was recently reviewed by Gary Vaynerchuk in a blind tasting format, so you know you were getting the best of his palate. 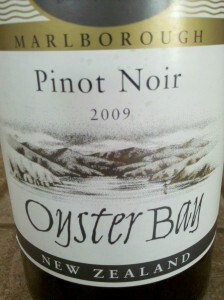 The 2009 Oyster Bay Pinot Noir pours a translucent cranberry color, appropriate to the grape. On the nose, it exhibits a TON of cherry, but you should also notice the vanilla and smoke character. Honestly, that was about all I got out of the wine, though you do get some tart cranberry on the palate. The mouth feel is silky smooth and of medium body, which was a bit richer than I expected, doubly so when you consider the 13.5% ABV. The finish is tart and full of mouth-watering acid, with a solid 30 second echo of cherry ringing in the mouth. The acidity makes this very food friendly, though I found it palatable on its own. Your personal preference will obviously veto mine. I’ve seen others comment that this wine really shines with some exposure to air, say after a few hours. I tasted this as a pop-n-pour, so I can’t speak to this potential added complexity. I would definitely like to try it again and give it a good decant and a good 45 minutes in the fridge to bring the temperature down, as this was consumed a bit warmer than I typically like. Overall, a solid BUY that pairs well with pork chops off the grill. Pinot lovers of all experience levels should definitely be checking out their local shops New Zealand section and wine shops should be placing these wines in their Pinot Noir section so consumers won’t miss out on these great drinking wines.